Ald. Edward Burke is standing by an ordinance to categorize attacks on police officers as hate crimes, asking, "Why would I drop it?" CITY HALL — A powerful alderman is refusing to back down on a so-called Blue Lives Matter Ordinance, which would categorize any attacks on police officers as hate crimes. "Why would I drop it?" Ald. Edward Burke (14th) said during a news conference Wednesday at City Hall proposing that the Police Department be equipped with combat-level blood-clotting kits. While Burke has determinedly avoided using the phrase "Blue Lives Matter," he didn't back down from his position when asked Wednesday about the ordinance he submitted in June. "I think police lives are as important as our lives," Burke said. "I don't see any reason why we shouldn't honor them and follow the lead of so many other jurisdictions around the nation who are passing these laws and standing up for the rights of police officers, firefighters and paramedics." While Burke has insisted other cities have extended hate-crime protections to police officers, firefighters and paramedics, critics have contended that it would have a chilling effect on free speech if anyone speaking out against police abuses could be suddenly subject to hate-crime penalties. The American Civil Liberties Union has labeled it "a distraction," insisting that "existing laws appropriately penalize acts of violence against a police officer or first responder." Other critics have said it debases the Black Lives Matter movement. Burke's proposal would increase fines for committing a crime against public-safety personnel from a range of $25-$500 to $500-$2,500. It would also allow jail terms of up to six months for violations. That would be on top of any other violations, say for assaulting an officer or the like, which critics point out already carry higher penalties. They contend that hate-crime protections, especially for verbal abuse, should only protect "marginalized" communities that have been historically discriminated against on the basis of race, religion, color, national origin, age, ancestry and sexual orientation. 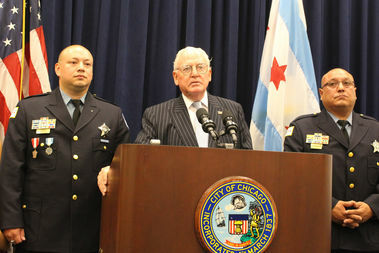 Critics say police do not merit such additional protections, while Burke insists they do. The measure has met significant resistance in the City Council, with Ald. Ameya Pawar (47th) suggesting it could polarize an already divisive debate the city is going through on police accountability. Ald. Ariel Reboyras (30th), chairman of the Public Safety Committee, has advocated delaying debate on the issue and has not brought it up for consideration.